We welcome individuals, churches and presbyteries who wish to join in relief efforts. Through these efforts we hope to share the love of Christ by meeting victims’ immediate needs as well as helping to rebuild their lives. Pray that God’s Kingdom will be extended through this work. Pray for prayer supporters and financial supporters committed to disaster response. This ministry is funded solely by designated gifts to MNA. Pray for the development of good relationships with churches and presbyteries who will benefit from this ministry in the coming years of work. Pray for God’s help and sustaining presence for the victims of disasters. Perhaps you cannot particpate by volunteering yourself and maybe you’d like give of your time and your treasure. Prayerfully consider participating with us through your financial support. You can contribute by sending checks to “Mission to North America” and putting “Rick Lenz” in the memo line on your check. Mail to Presbyterian Church in America, Mission to North America, 1700 N. Brown Rd, Ste 101, Lawrenceville, GA 30043-8143. You may also contribute online at the MNA section of the PCA website by clicking on the Disaster Response Specialist OK-TX. Money contributed is deductible. 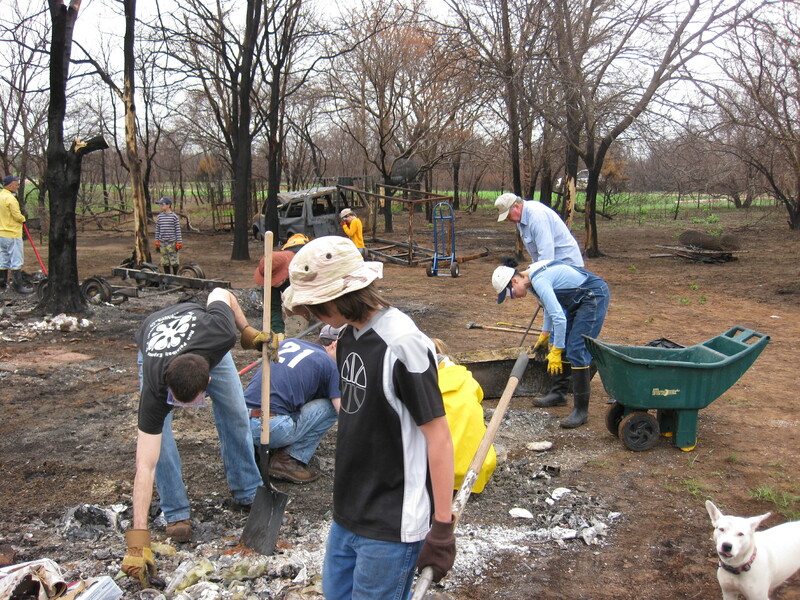 Maybe you would like to be the “boots on the ground” and be part of the team cleaning up or rebuilding after a disaster. Disasters provide opportunities to serve your neighbors in the United States, sharing both the declaration and demonstration of the love of God in Christ Jesus. To learn more about short-term mission trips, please contact Sherry Lanier at 678-284-3012 or at slanier@pcanet.org. I am also available to meet with church and presbytery leaders to discuss disaster response ministry involvement and to help with disaster preparation. Maybe you can provide supplies, equipment, transportation, lodging, food, etc. You can also register at Mission to North America Disaster Response (opens in a new window).